Palm Coast, FL – Start a new tradition with Sunday Brunch at Hammock Beach Resort’s Atlantic Grille. Beginning Sunday, Dec. 6, the beachfront restaurant will offer the weekly brunch from 11 a.m. until 3 p.m. Open to the general public and resort guests, reservations can be made by calling (386) 246-5565. 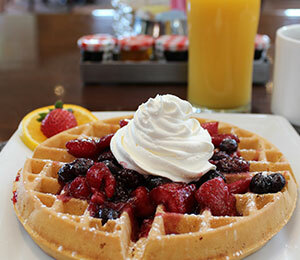 The award-winning restaurant will offer a refreshing menu of brunch favorites. Sunday Brunch at the Atlantic Grille features a chilled and smoked seafood display with smoked salmon, crab claws poached shrimp and more. Traditional breakfast items include eggs Benedict, French toast, and omelet stations. For guests looking for lunch items, Sunday Brunch includes butter-poached shrimp & grits; herb roasted chicken with blackened potatoes; and grilled mahi mahi with citrus relish. Sunday Brunch at the Atlantic Grille ends on a sweet note with desserts that include a seasonal cobbler, chef’s selection of bread pudding, miniature pastry display and fresh fruit display. Cost is $31.95 per adult and $15.95 for children ages 4 – 12. Price of adults includes bottomless mimosas and bloody marys. To make reservations or receive more information about Sunday Brunch at the Atlantic Grille, call (386) 246-5565. The Atlantic Grille, which is open to the public, is located at the AAA Four Diamond-rated Hammock Beach Resort at 200 Ocean Crest Drive, Palm Coast, FL 32173. For more information about Hammock Beach Resort, visit www.HammockBeach.com or call (386) 246-5500. Operated by Salamander Hotels & Resorts, the AAA Four Diamond-rated Hammock Beach Resort is conveniently situated along 2.4 miles of spectacular Atlantic beach on Florida’s Palm Coast. Hammock Beach features over 300 accommodations, including a 12-story tower of luxury suites. The resort also features countless other amenities for families and groups, including a multi-level water and swim pavilion, indoor atrium pool, spa and fitness center, casual and fine dining restaurants, and oceanfront meeting and function space. Hammock Beach is famed for its two spectacular golf courses: the Ocean Course, designed by Jack Nicklaus, is one of Florida’s highest rated and plays six holes directly along the Atlantic Ocean. The Conservatory Course was designed by Tom Watson and is one of Florida’s longest layouts, characterized by waterfalls, babbling brooks and field stone work. For additional information call 386-246-5500 or visit www.hammockbeach.com.